Leading Manufacturer of front cylinder press brake, real cylinder press brake and press brake nc cnc series machine from Rajkot. Shailesh introduces now premium and state of the art metal forming machinery both for capital good and consumer durable industries. In metal forming section press brake now become an important production equipment, Which has wide application both in the capital and consumer goods sectors. CNC controllers have increased its utility by way of productivity. The machine body is in an overall welded and overall processed structure, and ANSYS finite element analysis software is applied to main parts of the machine body for analysis .which has ensured the reliability of machine tool and the precision of the entire machine. Closed loop control mode composed of electro-hydraulic servo valve imported from Germany and imported grating ruler is adopted for the main oil cylinders on both sides, to break through the stroke control pattern of traditional bending machines of mechanical stopper type, typical of high feedback precision for position of gliding block, accurate and stable operation good synchronizing performance and high repeated positioning precision of gliding block. Imported parts are used for all the functional parts in the rear stopper, to ensure the stopping precision of rear stopper and the mechanism of rear stopper will multiple stopping shafts for more complete functions are employed up to customer requirements. Integrated control system imported from Germany is adopted for the whole hydraulic system, to simplify the installation of pipelines, and to ensures stable operation as well as the simple and nice appearance of the machine tool. C-shaped plates are fitted on both sides of the machine body, and the high-precision grating ruler is mounted on the C-shaped plates, thus to avoid the influence over bending precision arising from distortion of machine body during the bending process. The lower workbench is fitted with automatic compensation mechanism for hydraulic deflection to achieve an effective dead zone free compensation with high bending precision and long stability guaranteed. The numeric control system refers to the numeric-control system special for electro-hydraulic servo bending machines of Italian ESA Netherland DELEM, or Swiss CYBELEC Companies, able to achieve the functions of graphics programming for bending angle, compensation for angle amendment, automatic calculation and adjustment of bending pressure, automatic calculation of compensation for workbench distortion, extending length of workpieces, bending pressure for sole pressing, open distance, and automatic withdrawal of rear stopper, etc. Bending force and worktable compensation. Counting automatic, Operator warning system. We specialize in offering a wide range of Real Cylinder Press Brake to our clients at most economical prices. These presses are fabricated using an optimum quality raw material, ensuring its compliance with the international quality standards. With the aid of our skilled professionals, these presses can be customized as per the needs and preferences of our clients. 10 tons to 250 tons capacity. Strock Length 150 mm adjt. 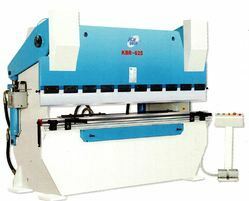 Design of KE press brake is based on S-R-B (synchronized bed reference) principle with Y - Y2 control. Rigidly welded, stress relieved frame ensures minimum deflection even under maximum load. Cylinders from high quality forged steel are precisely honed. Pistons are hard chromed for longer life. Rigid and accurate guiding of pressing beam to achieve the desired beam-tilt. Full electronic synchronization with proportional valve technology assures constant monitoring and correction of beam parallelism through CNC system. Stroke depth measurement through high precision linear glass scales up to 0.021 mm. Precise press beam depth mechanism enables desired bending accuracy and repeatability even over longer use. Off centre bending without any damage to a guiding system. Controller and backguage options available. Safety regulations as per the industrial norms. Off centre bending without any damage to the guiding system. Color Scream as Per Your STD.